Irena Dubrovna (Simone Simon) seems to have an obsession with a black panther at the Central Park Zoo. She catches the eye of handsome ship-builder, Oliver Reed (Kent Smith). The two quickly fall in love, but Irena is, at the same time, strangely distant. Even after they are married she has reservations about consummating the marriage. Irena believes there is an inherent evil in her. She thinks she might be descended from witches that were driven out of her village by King John of Serbia. The cat was the symbol of those witches, and if she’s ever aroused to passion she will become a cat and kill her lover. Oliver thinks she’s insane and as he struggles to deal with it, an unscrupulous psychologist (Tom Conway) looks to take advantage of the situation. 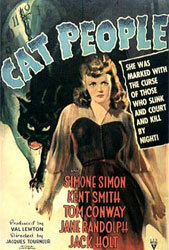 A lush and moody film, Cat People is a magnificent piece of low-key horror that is wrapped in a tragic love triangle. Irena’s struggles to push back against the evil inside, only to slowly give in to her instincts. Oliver goes to great lengths to help her, only to fall into the arms of another woman. This is interesting drama in itself. Toss in some fascinating Serbian mythology, clever use of sound, lighting, and occasionally a live black panther, and you’ve got something truly engrossing to watch. The story is, for the most part, a slow burn as we see little elements of darkness and cunning creep into Irena’s personality. Things really pick up speed in the final act where the story doesn’t shy away from a grim ending. Great stuff, I look forward to more Val Lewton productions in the future.